Listed in the 1 July 1921 Department of Commerce Radio Service Bulletin as licensed as a Special Land License with the call letters of 7YL. The licensee was North Central High School, Spokane, WA. 2 May 1923 First licensed as a commercial broadcast station with the call letters KFIO. The licensee was North Central High School, Spokane, WA. 12 Apr 1927 Granted a Temporary Permit for 1100kc with 100 watts. 1 Jun 1927 Granted a license for 1220kc with 100 watts, shared with KFPY. 20 Feb 1928 Granted 1220kc with 100 watts, shared with KFPY and probably KGY. On 11 Nov 1928 reallocated to 1230kc with 100 watts, daytime. 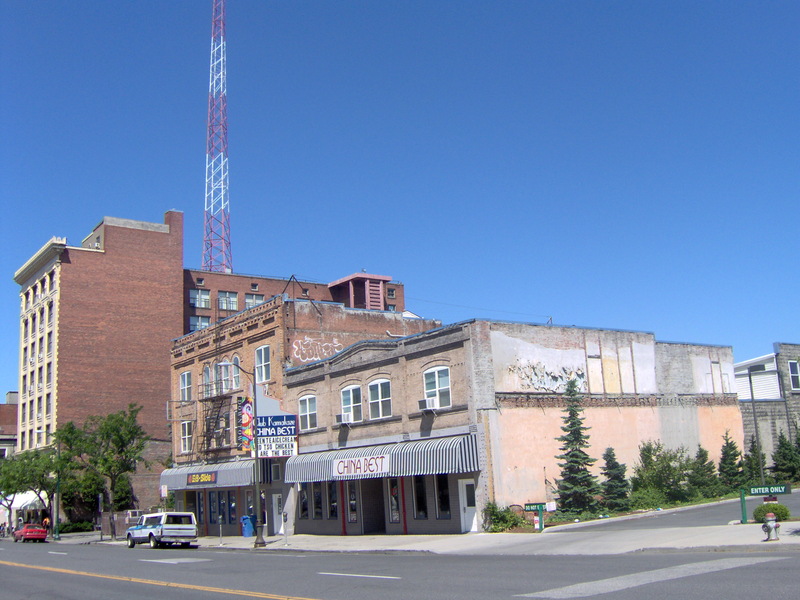 23 Aug 1929 Voluntary assignment of license to Spokane Broadcasting Corp.
8 Mar 1930 Granted 1120kc with 100 watts, daytime. 24 Mar 1941 Under NARBA, they were granted 1150kc, 100 watts, daytime. 17 Jul 1941 Granted a Construction Permit for 1230kc, 250 watts, unlimited. License to cover the Construction Permit granted 3/26/42. 16 May 1950 Voluntary transfer of cont. of license corp. from Arthur L. Smith to Louis Wasmer. 29 Aug 1950 Voluntary assignment of license to Louis Wasmer, eff. 8/31/50. 24 Jul 1952 Voluntary assignment of license to D. Gene Williams and Delbert Bertholf, A Co-partnership, with the condition that Bertholf sever all connection with KGA. eff. 8/1/52. 1 Oct 1952 Granted a Construction Permit for 1340kc, 250 watts, unlimited. License to cover the Construction Permit granted 1/26/53. 6 Jun 1957 Granted a Construction Permit for 1230kc, 250 watts, unlimited. License to cover the Construction Permit granted 8/29/57. 17 Jun 1957 Call letters changed to KLYK. 26 Jun 1958 Voluntary assignment of license to KLYK, Inc., eff. 7/11/58. 8 Apr 1959 Voluntary transfer of cont. of license corp. to Marie Storm Taft, Archie G. Taft, Jr. and W.D. Simpson. 27 Apr 1962 Granted auth. to remain silent. There were extensions until 10/10/64 4/20/64 Voluntary assignment of license to D. Gene Williams, eff. 05/16/64. 22 Sep 1964 Call letters changed to KSPO. 8 Feb 1965 Invol. transfer of cont. of license corp. to Erleen S.Williams, Executrix of the Estate of D. Gene Williams, deceased, eff. 01/07/65. 15 Jun 1965 Voluntary assignment of license to Delbert Bertholf, eff. 6/22/65. 28 Apr 1967 Voluntary assignment of license to KSPO, Inc.
22 Jan 1971 Voluntary assignment of license to Radio Spokane, Inc., eff. 3/1/71. 25 Oct 1978 Voluntary transfer of cont. of license corp. to California Newspapers Inc., eff. 11/1/78. 25 Feb 1980 Voluntary transfer of cont. of license corp. to W.A. Brown, B.B. Leibert, J.J. Craemer, N.S. Yoffie, et. al. (all stockholders). Historical audio clip. Give them a listen! Some of the information is appearing with the permission of the original owner. Information extracted from this page may be used for academic purposes if prior permission is obtained from copyright holders and full credit is given to the original source and PhilcoBill's History of Radio in Spokane. DISCLAMER: This is a working research document and is correct to the best of my knowledge. However, I understand that some of the information on this page may contain unverified and incorrect facts. I am in the process of verifying all information presented. If you see incorrect information or have access to additional information, please contact me and I will make the appropriate corrections and adjustments. Please consider the information in this page to be copyrighted and that further publication of this material without permission is prohibited. The author will be held harmless from any damage done by use of the information contained here.